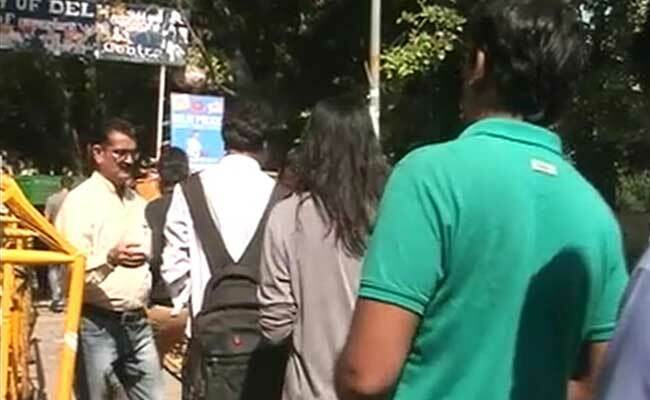 New Delhi: Delhi University Students Union (DUSU) election was held today with a "good" turnout being reported in the morning colleges. Press Trust of India reported that, according to DUSU election committee, a large number of students voters turned out to vote since 10 am in the 40 morning colleges. Polling for the DUSU elections in morning schools ended at 2 pm and voting reserved for students of evening colleges commenced at 3 pm and it continued till 7.30 pm. According to reports, the counting of the DUSU elections will be held tomorrow from 8.30 am. The exact number of voter turnout in DUSU elections would be known by late evening. Chief Election Officer S B Babbar told PTI that the authorities received calls from colleges about a good number of voter turnout. "We received calls from various colleges about a good number of students turning out to vote," he told the news agency. From the 51 colleges whose students elect the DUSU, the percentage of voting in 32 institutions where votes had been counted was 44 per cent, Chief Election Officer S.B. Babbar told IANS before the conclusion of voting to the evening colleges. Sources told IANS that there was 65 per cent voting in north campus based Hindu College and over 50 per cent in Ramjas College, 58 per cent in Shri Ram College of Commerce, 58 per cent in Rajdhani College and 53 per cent in ARSD College and 40 per cent in Deshbandhu College. For a smooth conduct of the elections, the DUSU election committee has deployed a total of 248 EVMs in all 40 morning colleges. Some technical glitch in the Electronic Voting Machines (EVMs) was reported at Shahid Bhagat Singh College, and which caused a half an hour delay in voting in the morning. The Rashtriya Swayamsevak Sangh (RSS)'s student wing Akhil Bharatiya Vidyarthi Parishad (ABVP), the Indian National Congress (INC)'s National Students Union of India (NSUI) and left wing outfits like Students Federation of India (SFI) and All India Students Association (AISA) were seen making last minute efforts to garner votes for their candidates. A total of 10 candidates are running for the post of President, in which the main contestants for the DUSU presidential post are ABVP's Rajat Choudhary, NSUI's Rocky Tusheed, AISA's Parul Chauha, independent candidate Raja Choudury and independent Alka. Sources told PTI that, there was around 14 per cent polling in Aryabhatta College, 45 per cent in Shraddhanand College and 557 voted out of 1,594 in Bhagini Nivedita College when the voting happened for morning schools. In Aditi Mahavidyalaya, out of 2,300 students, 690 voted in the morning session. Last year, the ABVP had bagged three posts while NSUI made a comeback, winning the post of Joint Secretary. Historically, a bipolar electoral affair, the election this year in Delhi University has seen the rise of another student group, the radical left AISA, which has found many supporters among students after the brawl at Ramjas College in February and turned the usually bilateral contest between the ABVP and NSUI into a multi-cornered fight. Meanwhile, the Delhi High Court has given a go-ahead to the Delhi University to declare the results for the post of President in the DUSU elections which was held today. 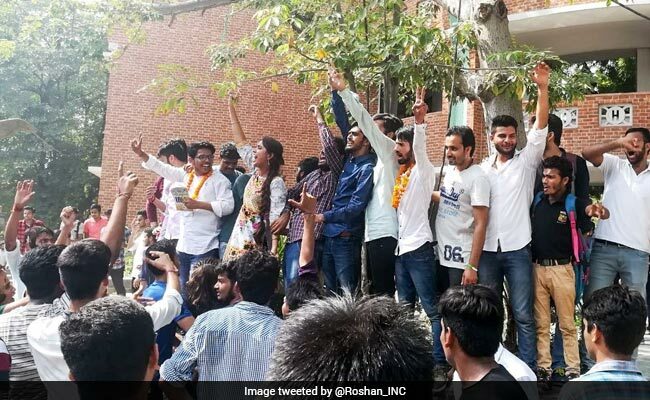 The High Court's order came on a plea by the University seeking modification of its September 8 interim order by which it had allowed NSUI presidential candidate Rocky Tuseed to contest the election but directed the varsity not to declare the results for the post of the President.